Topics: The Mathematics Of Persistence, Internal Research, Artistic Process And Elegant Action, and Penny-pinching In The Stock Market. The site has about 44 users daily, viewing on average 4.00 pages each. 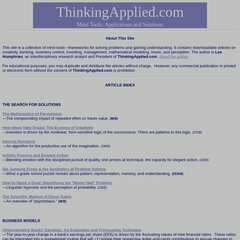 Thinkingapplied.com's IP address is 64.235.37.3. It has 7 nameservers, including darthmaul.aplushosting.com, fremont-ca-us.aplushosting.com, and houston-tx-us.aplushosting.com. It is hosted by Las Vegas Nv Datacenter Nevada, using Zeus/4 web server. PING (64.235.37.3) 56(84) bytes of data.